I remember going to the Cabra Grand to see war films about the American Marines fighting the Chinese in Korea. In 1959 Gregory Peck and George Pepperd starred in the film ‘Pork Chop Hill’. We all loved them kind of films and when they were over we’d head down to the railway at the back of the Picture House and make up our own version of the film. Well little did I know back then that a young lad whose family lived on Upper Killala Road died in that war. His name is Christopher Mulhall. When Christopher’s mother died his father remarried Christine Doyle, my fathers first cousin. 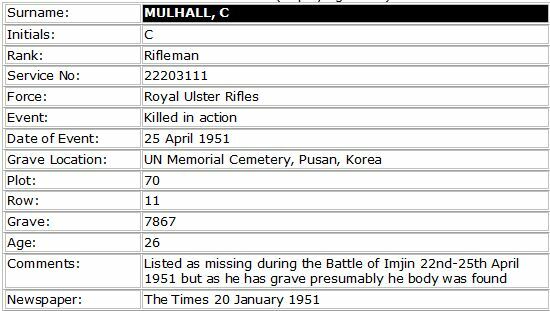 Christopher Mulhall joined the Royal Ulster Rifles and in 1950 was sent with his regiment to Korea. The 1st Battalion Royal Ulster Rifles disembarked at Pusan in early November 1950 as part of the 29th Independent Infantry Brigade Group. They were then transported forward to Uijongbu were they fought against Chinese guerrilla forces. 600 soldiers of the British Army took on a force of 30,000 Chinese troops crossing the Imjin River, locally known as ‘Happy Valley’ in Korea. At the end of the battle 10,000 Chinese troops had fallen. British losses stood at just 59, but only 39 of the survivors evaded capture. By mid December a defensive line was being prepared on the south bank of the River Imjin protecting the approach to Seoul, the capital of South Korea. At the beginning of 1951 the 50th Chinese Communist Army engaged the United Nations troops focusing on the 29th Brigade, who were dispersed over a very wide front (12 miles). The Ulster Rifles, fighting with the 5th Northumberland and Fusiliers were able to hold their position in their first major action at the Battle of Chaegunghyon, temporarily holding back the Communist Army. Orders were issued for a complete withdrawl as wave after wave of Chinese soldiers poured onto the battlefield in an attempt to break through the UN positions and take the South Korean capital of Seoul. 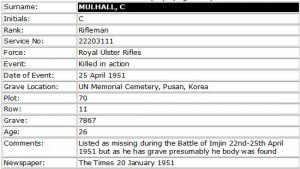 Christopher Mulhall was part of the British 29th Infantry Brigade assigned to hold back this attack. Despite being greatly outnumbered the Brigade held its position for three days. Chinese troops attempted to encircle the entire Brigade who came under heavy enemy fire. Before dawn that day indistinct figures appeared in front of the Royal Ulster Rifles trenches. A patrol descended into a part of the valley and men on the hills heard a staccato burst . . . then silence. The patrol had blundered into the main assault force and suddenly and almost from nowhere the Chinese broke cover and charged. Two platoons of the Royal Ulster Rifles were overrun. With their flank exposed the Rifles headed down the valley which was overlooked by thousands of Chinese troops and found themselves trapped in a slaughter house of enemy fire. Along with many of his brave comrades Dennis Mulhall fell in battle. 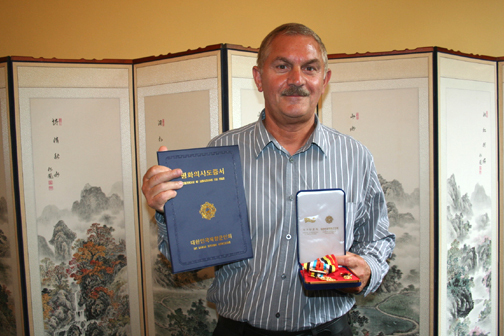 In June of 2010 the Government of South Korea celebrated the brave men of Ireland who played a part in the Korean War. I was invited, along with my cousin Barney Mulhall and many others to attend this event in their embassy in Dublin. 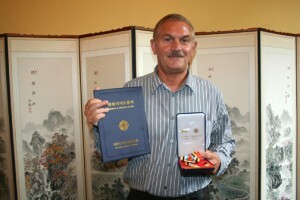 Barney was presented with a token of gratitude on behalf of his half brother Christopher Mulhall. 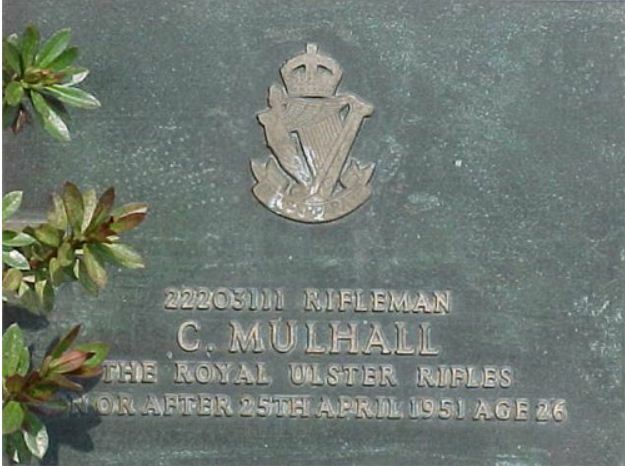 This plaque commemorates and remembers Rifleman Christopher Mulhall.